The Les Schwab Amphitheater in Bend provides a beautiful outdoor riverfront venue for locals and visitors to enjoy concerts and other events. Situated next to the beautiful Deschutes River. One of Bend’s most popular venues for outdoor concerts and events. Performances by top entertainers, as well as free concerts by local and national artists every Sunday during the summer. The Amphitheater accommodates 8,000 people. The Les Schwab Amphitheater can be found in Bend’s historic Old Mill District. Built in 2001, this beautiful outdoor theater is named after Les Schwab, a highly respected Oregonian who has played a significant role in Central Oregon’s success. Situated next to the scenic Deschutes River, this popular venue provides a relaxed outdoor setting for concerts and other events. The Amphitheater accommodates about 8,000 people. Throughout the summer, some of the most famous names in entertainment perform there, and free concerts by local and national talent are given every Sunday. The Bend, Oregon Amphitheater is located on the riverfront just off SW Colorado Drive in Bend. The street address is 344 SW Sevlin-Hixon Drive. Phone: 541-312-8510 (live help) or 541-322-9383 (recording). 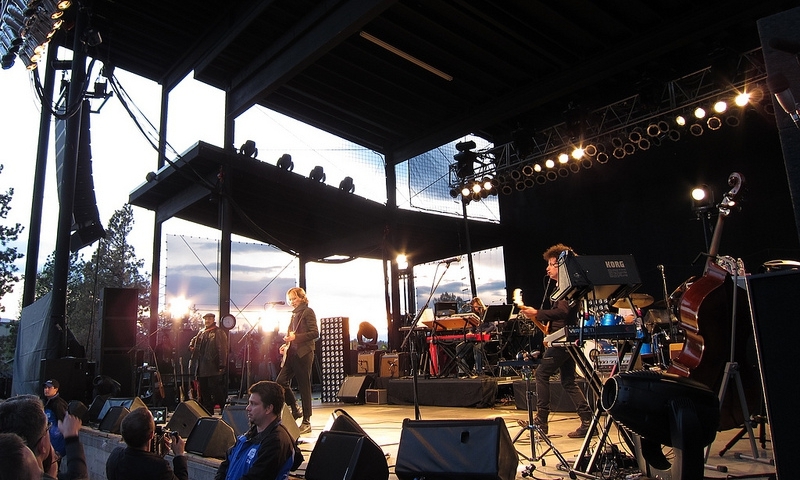 The Les Schwab Amphitheater is primarily open during the warmer months. Hours depend on the particular event; gates open 1.5 hours prior to show time. See the schedule of events. Fees depend on the event. Sunday concerts during the summer are free. Tickets for concerts and events can be purchased online here. You are welcome to bring binoculars, blankets and beach towels, cameras, low-profile lawn chairs and sealed or empty plastic water bottles – water is available on the grounds. Once inside the Amphitheater, guests may not leave and re-enter the venue so it is suggested that you also bring sunscreen and a jacket or sweater to wear when the temperature drops.